I’m not a person who’s known for travelling light. And when it comes to my living space……well, after 8 years in Thailand, there’s an awful lot of stuff. Recently I’ve been making efforts to dejunk. I packed clothes and shoes I no longer wear, and kitchenware and appliances I rarely use, into boxes for clearing out. But I hate to see such items go to waste; they might be redundant to me but another person could make good use of them. In the UK, ordinarily I would donate unwanted clothes, shoes and books to one of the many charity shops that occupy most town centres. In Thailand, few charity shops exist. I can remember donating clothes and bedding to a hill tribe foundation in Chiang Mai in 2007; but in Bangkok, previously I’ve left old belongings to the cleaners of apartment blocks or even on the streets, hoping that one of the collectors who salvage and resell items from people’s garbage would opportunely come across them. 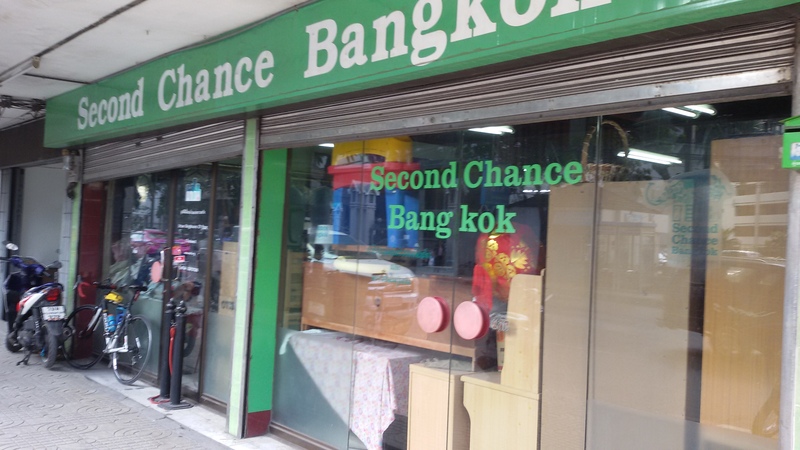 Recently, I became aware of an organisation called Second Chance Bangkok (SCB), which supports various educational, medical assistance and other community programs for residents of Khlong Toey slum. SCB relies on donations of second-hand items—mainly from expatriates—for resale or passing on to members of the community without the resources to purchase such goods. The items welcomed for donation include clean clothing, baby clothing/items, kitchenware, toys, furniture, books, bedding, sports goods, household appliances, computers and office equipment. This afternoon I took my unwanted items to the SCB shop in Artnarong Road, Khlong Toey. The outlet was on the main road and relatively easy to find by taxi. I had called ahead to check the shop was open and spoken to a lady—I believe called Oi. When I arrived at the store she thanked me for my donation and invited me in so she could hand me a brochure. It was interesting to see inside the small shop area, which was rather chaotic and seemed to be bursting at the seams with mainly old clothes, furniture and toys. A few people were loitering and silently sifting through the items; and one cheerful elderly man—in an old fedora hat—seemed to be just hanging out on the sofa, chatting to staff and chuckling as I approached. I left feeling glad I had made the effort to take my belongings to the store—hopeful that someone might make better use of them. One of the items I had donated was a tight-fitting leopard-print dress I bought on a whim on sale in the UK and never had the courage to wear. I’m not sure there are too many Thai women who would fit into the dress but, who knows, maybe some Khlong Toey ladyboy might snap it up?! The SCB shop opens Monday to Friday from 9.30am to 5pm and also provides a pickup service on request. Contact the store on 02-249-1921 or info@scbkk.org. Ooh, thanks for posting this! I could definitely make use of this, I have lots of rubbish that I should get rid of and I hate just throwing things away. If I happen to see a ladyboy in a tight, leopard-print dress, I shall think of you! Haha. Wow that was a good day for her!